At the forefront of a generation of artists working with new media in the 1960s, light as an artistic medium pioneered a new effort amongst installation artists to achieve an ethereal, sublime environment through their constructions. The Art of Light: Flavin, Turrell, Wheeler, Holzer, Eliasson & Paik, addresses the varied perspectives facilitated through light installations over the past half-century through the work of 6 artists, globally celebrated for their mastery of this complicated and highly emotional medium. Original key installations that exemplify the developing relationship between light and the art world will be reproduced for this exhibition, alongside new, large-scale commissions within the Imperial Palace’s individual Pavilions. The examination of each artist represented will approach the numerous platforms (whether political, scientific, etc.) of light’s persuasion, all while exemplifying the man-made sublimity that is made possible through the universally awe-inspiring, primal relationship between light and dark. Dan Flavin was the original light-based artist, radically limiting his materials to commercially available fluorescent tubing in standard sizes, shapes, and colors, extracting banal hardware from its utilitarian context and inserting it into the world of high art. He devised a radical new art form that circumvented the limits imposed by frames, pedestals, and other conventional means of display. Douglas Wheeler and James Turrell represent the highly influential light and space movement of Los Angeles. Their work speaks to viewers without words, impacting the eye, body, and mind with the intention of simulating a man-made spiritual awakening. Their manipulation of light allowed it to melt into its corresponding space, slipping out of sight; this in turn captured energy as a medium, taking the intent of the Italian futurists to a new fruition. Jenny Holzer drew great inspiration from politics, infusing sublime light constructions with arresting textual content, including “abuse of power comes as no surprise” and “protect me from what I want” bringing new depth to each opposing medium andthe light installation. 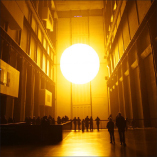 Olafur Eliasson’s use of light is elemental and ephemeral, infused through a man-made simulation of sublime natural events. His work navigates a space between nature and technology, the organic and the industrial. The components of these highly installations create an experience through light that is at once physical, sensory, and emotional. Finally, the work of Nam June Paik --composer, performer, and video artist-- played a pivotal role in introducing artists and audiences to the possibilities of using video based light for artistic expression. His works explore the ways the light of video images, frozen into sculptural form, can be used in various combinations to question our accepted notions of the nature of television. A survey of these artists presents light’s installations ongoing journey through the fine art world: its slow progression from the once alerting quality of its mere presence within a fine art context, into its potential for political evocation, and finally its capability to extract the viewer’s most vulnerable and sublime reactions, bringing it to the forefront of effective contemporary art.